Turkey announces the closure of 131 news outlets. Which are the major ones? The overseas media is alight with the news that dozens of media outlets have been closed down in Turkey under a decree granted by state of emergency powers in the country. In Turkey, the story is getting remarkably little coverage. The full list of closed outlet available in the second repeat edition of the Official Gazette published yesterday, 27 July. Scroll to pages 61-63, where you will see they are divided by news agencies (three of them), television and radio stations (39 in all), newspapers (45), magazines (15) and publishing houses (29). That’s a total of 131 outlets. Most of the 45 newspapers are regional titles distributed in specific cities, but the nine of them are national papers that most external observers will recognise. Here’s a crash course in a few of the outlets that are no more. In Turkey, it is news agencies that have the most extensive networks of correspondents to draw upon when reporting on day-to-day events across the country. Newspapers and broadcasters do have teams of their own reporters, but when a story breaks in a small, indistinct part of the country – in the eastern town of Artvin, for example – they are likely to draw upon a correspondent attached to one of the four big news agencies. The largest of these is the state-run Anadolu Agency (AA). Until recently, it had three major and robust rivals: Doğan, İhlas and Cihan. The last of these has long been associated with the Gülenist movement, but it was also an important source of news. Turkey has held four nationwide elections since March 2014 and in each of them, Cihan provided an alternate feed of ballot box results that often conflicted with AA’s feed. The controversial Ankara mayoral election was one such significant episode. Like the Zaman and Koza İpek groups (below), Cihan was seized by court-appointed administrators in March this year. Most photo and video journalists were retained, but the bulk of reporters were sacked. They moved to the hastily established Muhabir Agency which, like Cihan, was closed down this week. 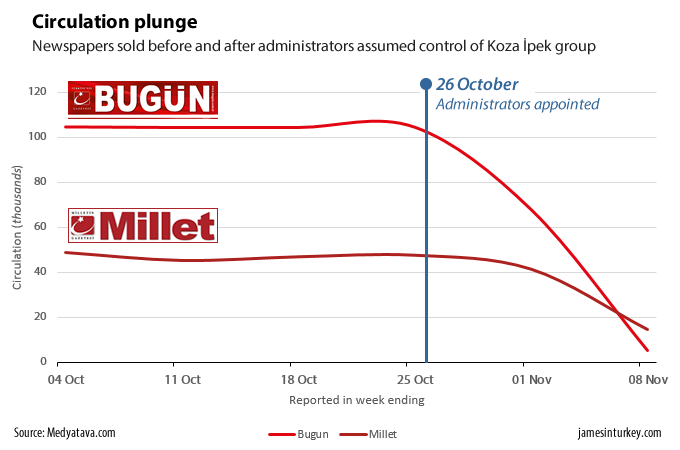 Owned by the Koza İpek group, the Bugün and Millet newspapers were seized by administrators on 26 October 2015. The holding group was known to have links to Fethullah Gülen, the US-based preacher implicated in the failed coup attempt earlier this month. Both titles – along with TV stations in the same group like Bugün TV and Kanaltürk – had been critical of the government up until the moment they were seized. The administrators adopted a markedly different tone after they were appointed. Circulation plunged and the newspapers eventually folded. Zaman was for decades known as the flagship Gülenist title in Turkey. It took a strongly pro-government line until around 2013, when the first corruption allegations against then-Prime Minister Recep Tayyip Erdoğan’s government began to surface. It then shifted into an anti-government position, which it retained until administrators were appointed to its parent group earlier this year and the tone swung back once again. Its English-language counterparts, Today’s Zaman and Sunday’s Zaman, were founded in 2007 and used by many foreign observers as their window into understanding day-to-day Turkish affairs. The Turkish title was controversial for its reported circulation figures. For years it was reported as the newspaper with the highest readership, boasting an average daily circulation in excess of 900,000 copies. But the vast majority of these were postal subscriptions – often sold in conjunction with enrolment at a Gülenist school, for example – and only around 20,000 copies were sold at newsstands every day. As with Bugün and Millet, Zaman’s circulation plunged after it was seized by court-appointed administrators. As of last week it sold around 5000 copies a week. Many of its staff moved over to hastily-established alternative titles, Yarına Bakış and Yeni Hayat, which were also closed in yesterday’s announcement. Taraf burst onto the Turkish media scene in November 2007 with a series of explosive stories implicating senior Turkish generals in coup plots. The so-called Ergenekon and Balyoz trials dominated headlines in the country for months and led to dozens of convictions – including the former chief of general staff, İlker Başbuğ. Many in the government and political opposition hailed the trials at the time as a long-awaited penetration into Turkey’s so-called “deep state”, a shadowy network of corruption individuals using the apparatus of government to their own ends. But much of the evidence used in the trials were subsequently discredited and the convictions were quashed – along much of with Taraf’s credibility. The newspaper has since become a fairly minor anti-government title. It was a sad denouement for an outlet that, at its launch, described itself as one of Turkey’s few quality, highbrow newspapers. Taraf was certainly once popular amongst liberal, highly-educated Turkish readers who previously had a narrow selection – including Radikal and Cumhuriyet – to choose from. It may have even contributed to Radikal’s falling circulation and its later decision to withdraw a daily print edition. If Zaman was the flagship Gülenist newspaper, then Samanyolu was the flagship Gülenist television network. Samanyolu has existed for decades but its heyday was in the middle of the last decade, particularly when its soap operas became popular for their storylines about Turkish nationalism and Sufi mysticism. At its height, it boasted a network of radio, news, shopping and children’s channels. Viewership plunged in October last year when the suite of channels was removed from Turkey’s main digital satellite platform Digiturk. All have now been closed down.